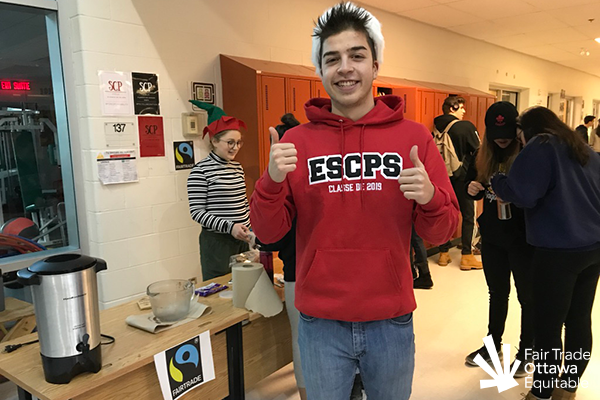 Emanuel Lukawiecki, Director of Education & Outreach for Fair Trade Ottawa Équitable and enthusiastic hot chocolate server! 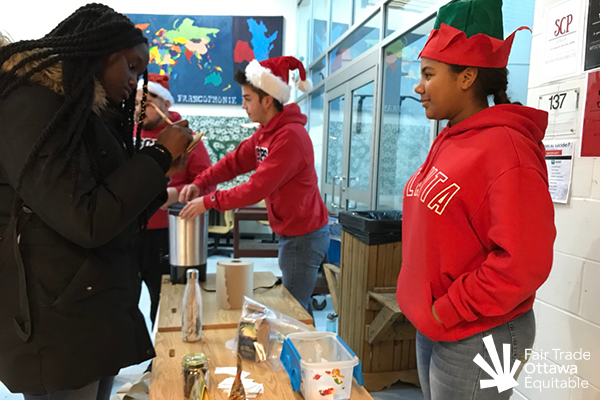 This holiday season, the student body of Pierre-Savard treated its students to hot chocolate. This activity kicked off the 10 Days of Christmas planned for the days leading up to the Christmas break. As the minister of the environment, one of my many roles is to make sure that all activities run at the school are eco-friendly and do their part to encourage a green lifestyle. 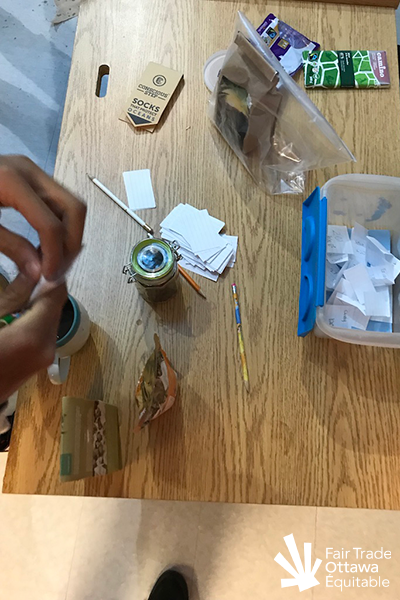 That’s why this activity was only offered to those who brought their reusable mugs to school that day, so we didn’t have to offer single-use cups to the students. 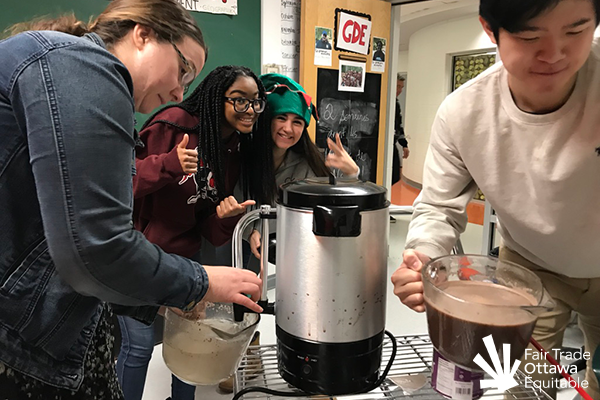 Additionally, we used fair trade hot chocolate instead of Tim Horton’s hot chocolate with the hope that the activity would give the students great hot chocolate and teach them about the importance of fair trade. This is why I ordered promotional posters and badges from Fairtrade Canada to place all over the school and hand out to the students. The items ordered didn’t quite arrive on time, which meant I had to get creative and make my own posters and badges that would convey the same message. I printed out a few Fairtrade International logos and SPP (Small Producers’ Symbol) logos and placed them all around the school to raise awareness for fair trade. 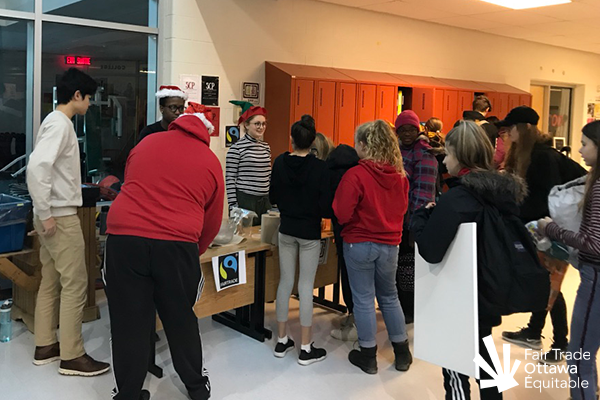 I also brought many of my own fair trade products from my house, such as coffee, tea, chocolate bars, lip balm, mangoes, socks, and chocolate chips for a fun guessing activity that had students guess how many items were in the jar for a chance to win a Camino mint dark chocolate bar. After this, I found Camino’s FairTrade hot chocolate online but my next challenge was to find a store that had the product and had enough available to sell me roughly 20 cans. This led me to Ten Thousand Villages, which had just enough stock to sell me 19 cans. We arrived at school at 7AM to get everything ready to be served at 8:05, when school started. Looking back, this was not enough time to be prepared, but luckily I had a team there to help make sure everything went smoothly. In the early stages of planning, we’d understood that we had big, almost industrial-sized kettles to heat up the water. However, we had not verified this claim to make sure it was true. Turns out the “industrial-sized kettles” were actually 2 medium-sized kettles that took a long time to heat up water. To fix this problem, we decided to heat up 2 small kettles as many times as possible to fill up the larger ones, which led to a frenzy of running back and forth. 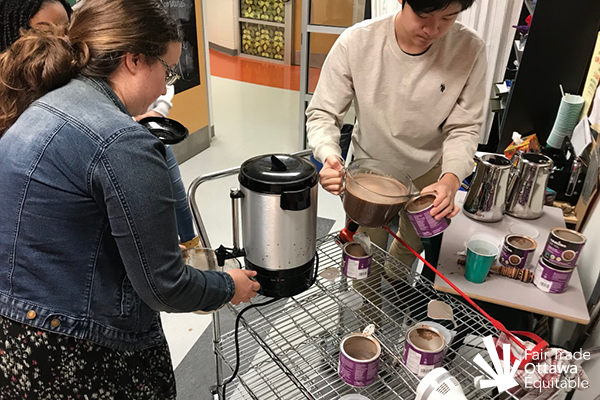 These Pierre-Savard students are willing to adapt if it means fair trade hot chocolate for all! This led to our next problem: having too many things on one outlet, cutting the circuits for short periods of time. As I was running around to get things prepared, the team placed all the kettles on one power bar, which led to the almost immediate shut off of power to that plug. This continued to happen throughout the day, which meant much more running around. Right before the start of school, we finally had a system that was functional but pretty hectic. We had one team heating up the water as fast as they could, then running it over to another team mixing the powder and water together with a drill in a big tub that would get constantly filled with water. Then another team would grab the big tubs and bring them over to the final team, the team that was serving. 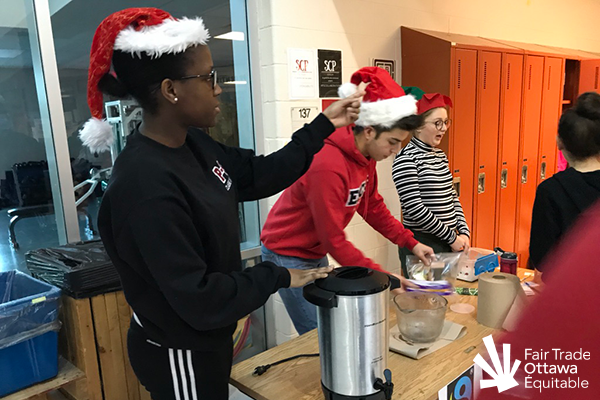 Students were able to get hot chocolate and also enter in a draw for a Camino bar, so these volunteers are working extra hard! 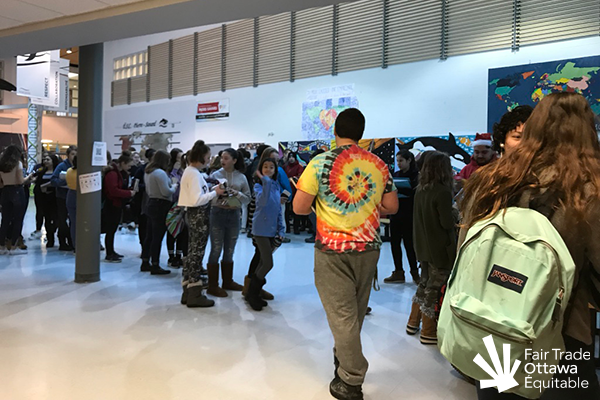 Finally, at 8:05AM, the students started lining up in the atrium to get their hot chocolate before class started. We managed to serve roughly 200 students and informed them about fair trade. I look forward to taking everything I have learned to run many more activities like this in the future! 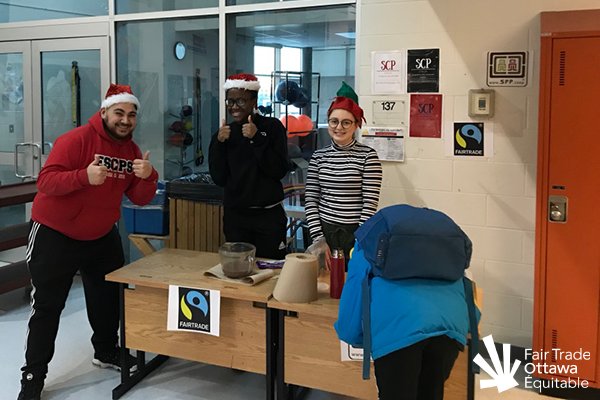 The Pierre-Savard atrium was filled with students that were excited to get their cup of free fair trade hot chocolate!